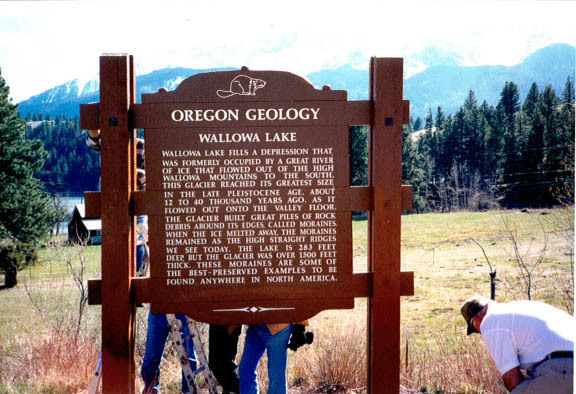 Wallowa Lake has been formed by the damming action of glacial drift. The easterly shore of the lake is a splendid example of a lateral moraine and the northern boundary of the lake of a terminal moraine. An outwash plain extends beyond the town of Joseph. The east and west lateral moraines record two major stages of glaciation and possibly several minor advances and retreats during each stage. The lake has a depth of 283 feet and the maximum height of the moraines is 1200 feet from lake bottom to crest. The glaciation occurred during the late Pleistocene Age approximately a million years ago and extended down to about this level.